Pinpointer, the “Point-Click” solution designed specifically for quick material identification and verification on the go and for various field deployments. 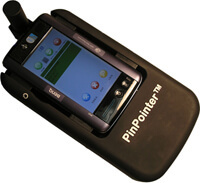 The PinPointer packs a full-featured Raman system in a true hand-held unit and is very competitively priced. This is the next generation of the portable Raman spectrometer that was featured in an episode of CSI Miami and a cave exploring documentary by NASA scientists on the National Geographic Channel. The unit is controlled by a miniature Windows computer and features easy-to-use ID-find™ software that provides one-touch identification of unknown substances by immediate comparison of a measured spectrum to the on-board Raman spectral library. Easy and Fast Substance Identification. Many substances emit a characteristic light when illuminated with a laser, the Raman scatter effect, that uniquely identifies molecular structure. With a touch of a button, the PinPointer collects and analyzes this scattered light from a chemical under test. The included ID-find software can search thousands of stored reference spectra to identify unknown substances. Within seconds, the detected chemical is identified and its name and properties displayed. Affordable, Compact, High Performance. The PinPointer provides the same performance as other handheld Raman spectrometers proposed for homeland security or on-site chemical identification but costs much less. Wide Chemical Coverage. The included ID-find software will search a database containing thousands of chemical spectra to find a match within a few seconds after data acquisition. Specialized chemical databases are sold separately. Users can also create their own custom spectral libraries simply by scanning known materials and saving the spectra using the library manager function of ID-find. Substance ID of Packaged Materials. Solid, powder or liquid samples can be analyzed while still contained in plastic bags or glass or plastic bottles or vials.